Its been just over a year since we moved into our new construction home and to be quite honest I’ve had a bit of a struggle watching the house turn from brand spankin’ new to, um, we’ll just say “lived in”. I promised myself when we moved in I would clean on a stringent schedule and keep it in the pristine condition it was in when we moved in. And then life happened and, yeah, not so much. Meet my cruddy kitchen sink. Sink, meet my amazing readers. Since I sort of neglected the sink and let it crudify itself I thought I’d share my shameful sink and how I got it back in shiny shape-WITHOUT using chemicals or smelly cleaners! First thing, slice your lemon in two and sprinkle it heavily with salt. 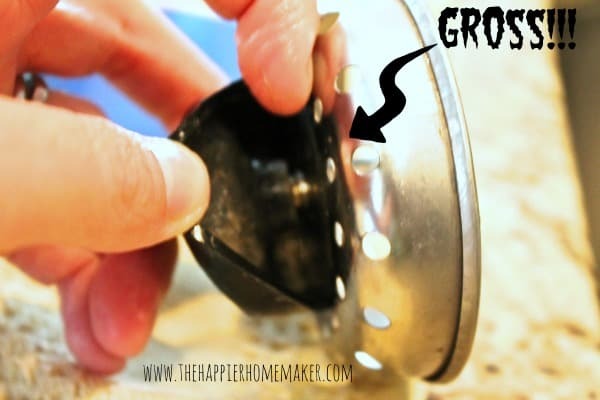 This is your scrubber-use it to scrub down the bottom and sides of your sink. When the lemon is juiced from the scrubbing move on to another section with more salt. 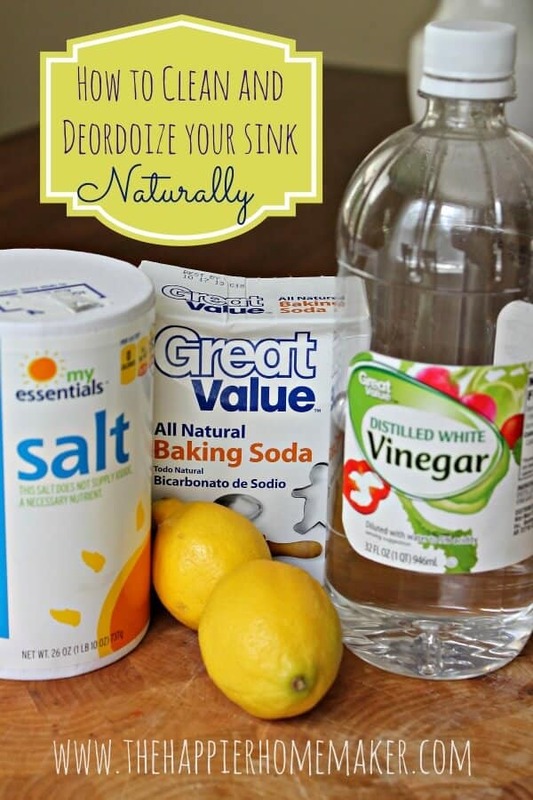 When you are finished rinse all areas of the sink thoroughly to remove any residual lemon juice and set aside the used lemons for later, we’ll be back to them! 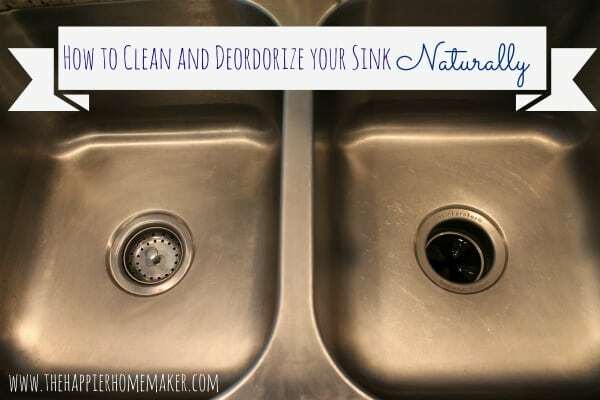 To make sure you sink doesn’t just look clean but actually smells clean too there are a few tricky places you have to get to where the nasty stuff hides. Like I dare you to go check this spot on your drain plug between the metal and the rubber stopper-gross stuff in there! I heated a bowl of vinegar in the microwave for 90 second and soaked my drain stopper in it for 5 minutes then wiped it out with a damp sponge. SOOOOOO much better! Another place to make sure you get is the underside of your rubber drain skirt if you have one. 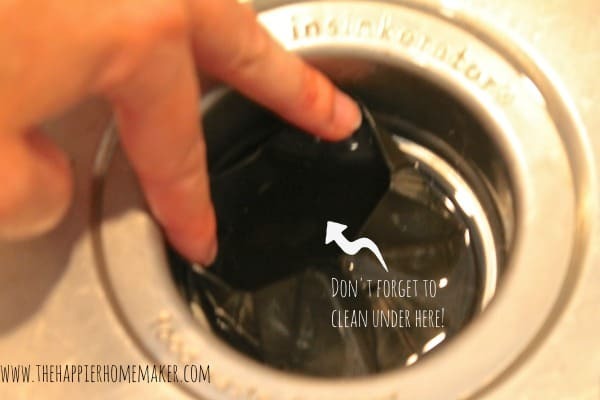 You can’t soak this area so for this wet your sponge in the warm vinegar that you are soaking the drain stop in and wipe the underneath portion of the rubber well. You may be grossed out by what is hiding under there-I was! Okay, now to clean and deodorize the drains! Watch that baby foam with stink-killing goodness! 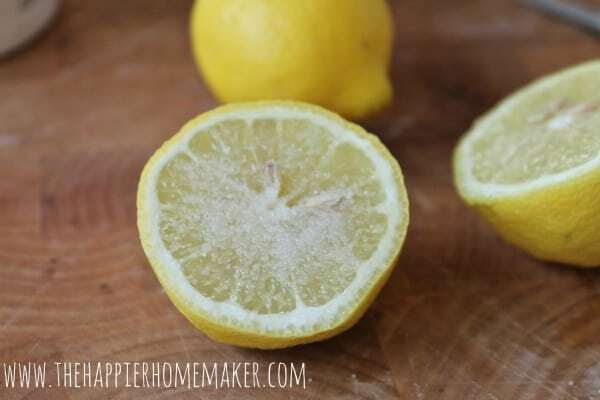 Now throw your leftover lemons in the garbage disposal, turn on the hot water and run it until they are gone. Congratulations, you have a sparkling, not-stinky sink and you didn’t use any harsh chemicals! Do you love cleaning with natural products? 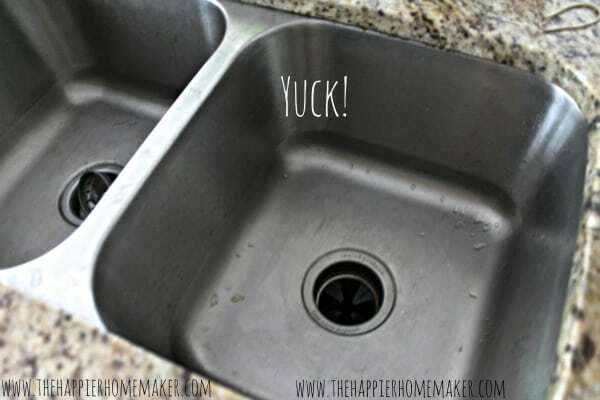 Be honest-is your sink feeling a little gunky lately, or am I the only one that forgets to do a deep clean? Looks and sounds like a great idea. I am going shopping tomorrow to get everything needed. I don’t have a garbage disposal, any ideas on the drain? GENIUS!!! I have never seen that trick salting the lemon!. very nice post, i certainly love this website, keep on it. Another suggestion for under the drain skirt is to use an old disposable toothbrush, then just toss when you’re done or rinse and use again. 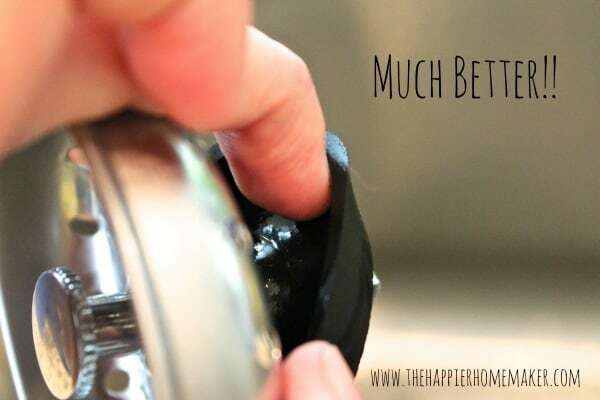 I actually used that in the ring just before the drain and on the garbage disposal warning.